Goa Chief Minister Manohar Parrikar infiltrated the Congress using disgruntled opposition politicians during the Lok Sabha campaign, a top Congress official said Wednesday. State Congress president John Fernandes also told the media that action would be taken against the party's Dabolim legislator, Mauvin Godinho, for working against the Congress candidate in South Goa Lok Sabha seat. "Now that elections are over, action will be swift and all those who damaged the party on Parrikar's instructions will be dealt with," Fernandes said. Ahead of polling for the general election, the Congress battled rebellions and indiscipline within the party which its leaders claimed were triggered by the BJP. Godinho rebelled against the Congress, claiming the party had been ignoring him and refused to campaign for his party's South Goa candidate Aleixo Reginaldo. On the eve of the election, former chief minister Churchill Alemao joined the Trinamool Congress after his request that either he or his daughter should contest from South Goa was turned down. 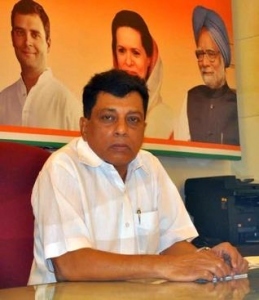 Outgoing MP from South Goa, Francisco Sardinha, proved to be a double headache for the Congress. First, Sardinha called the Congress "a party of thieves", refusing to campaign for Reginaldo, a sworn rival, after his own candidature was rejected. Then as if on cue, his son Shalom entered the fray resigning from the party and contesting as an independent purportedly with the blessings of his father. All the above Catholic candidates were expected to clip a chunk of minority community votes, traditionally known to favour the Congress. The Congress Party in Goa needs a thorough clean-out and clear out. Too many of the Congress MLA`s I.e Churchill & Mauvin along with the Monserattes & Ravi Naik are hardened by their criminal enterprises. It is time their licence and Free Passes to do as they please, to the detriment of both the Congress Party and Goan People is terminated. Sadly, the Congress Party has realised ,rather too late that too many Traitors infest he Party. Churchill Alemao thinks he owns the Congress Party and his Valanka bhai thinks she is an honorary CEO (Chief Executive Officer) of the Party. Ravi Naik`s selection too was a fatal mistake . The man is tainted, criminally inclined and rotten to the core.